Each post that I visit here, convinces me that you are one of the most gifted ladies in all of blog land! From food, to decorating, to recycling…you make it all look so easy and so beautiful! 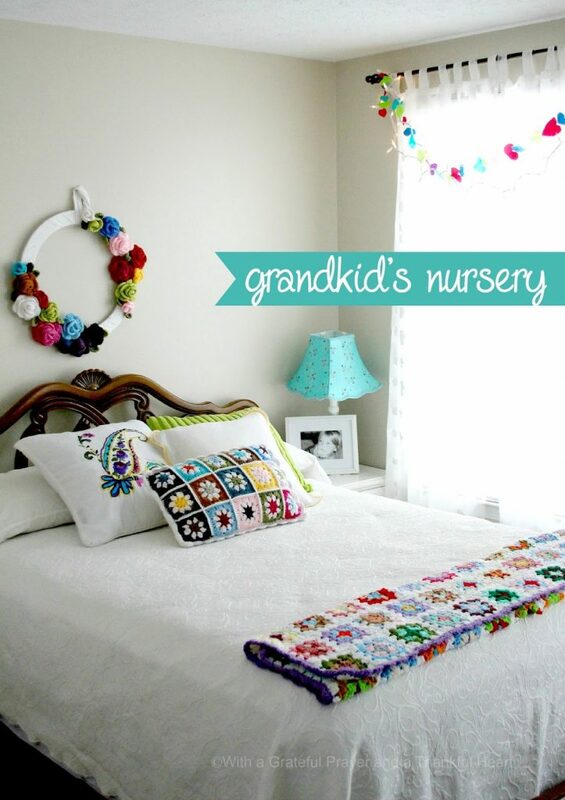 This room for your grandchildren is so inviting, and so cozy! I think the best part, is that you have a story with every piece you share. Did you paint that cat picture? What a wonderful room for your grandkids! I'd like to stay there, too. It's so cozy and inviting. I love the table that belonged to you when you were small. I have a table and two benches that a man made for me when I was very young. Right now it's in the attic because we have no space for it in our little house. This is such a beautiful room which any little boy or girl would love to sleep in. I love the sign too! 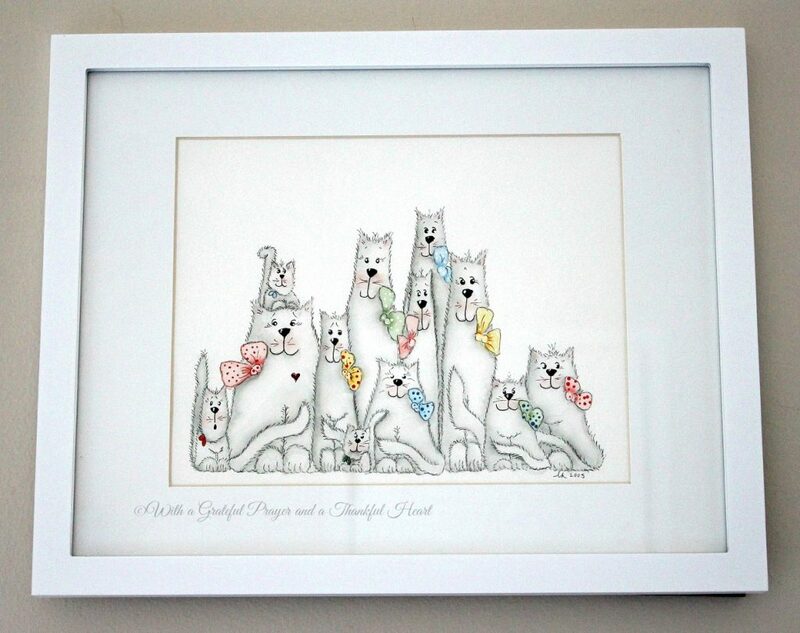 PS…did you do the sketch of the kittens? I noticed your initials. Represent your grands? 🙂 Awesome talent! 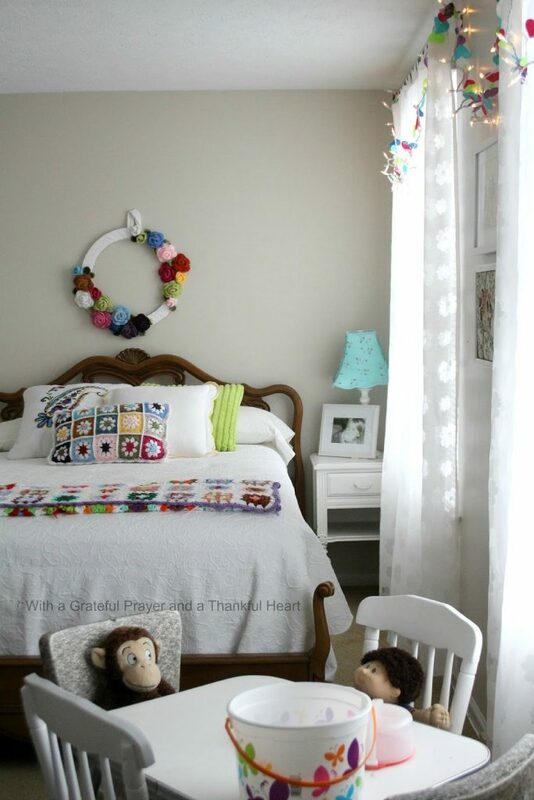 I love your Nursery! Its so pretty! And the table story is wonderful. 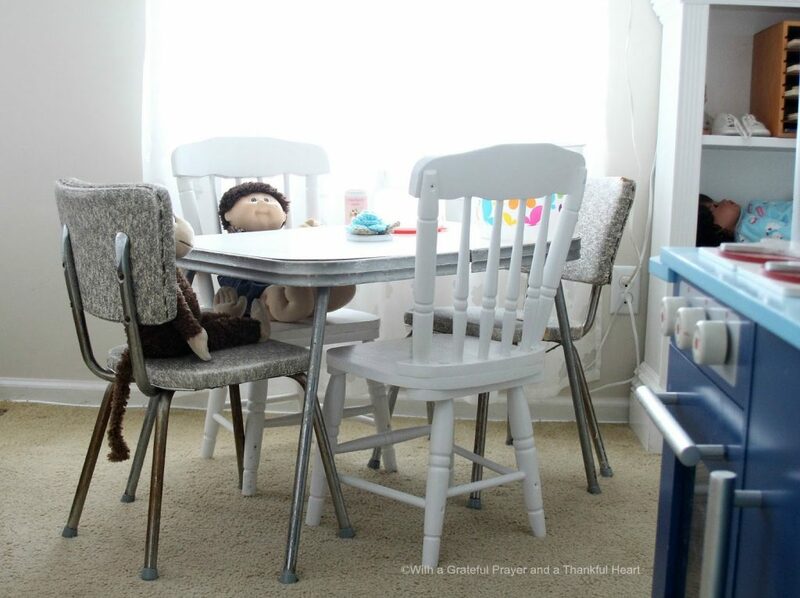 Do I see a Cabbage Patch Doll at the table? My Daughter had one, they are precious! What a darling room Lorraine! My Nana and Nunu (Italian for grandma and grandpa) had the same furniture! The headboard was different but the same bureas. Oh how I love that set. My Aunt still has it in the spare room of their house, hope to have it one day:-) So what do you have planned for the week, do tell. 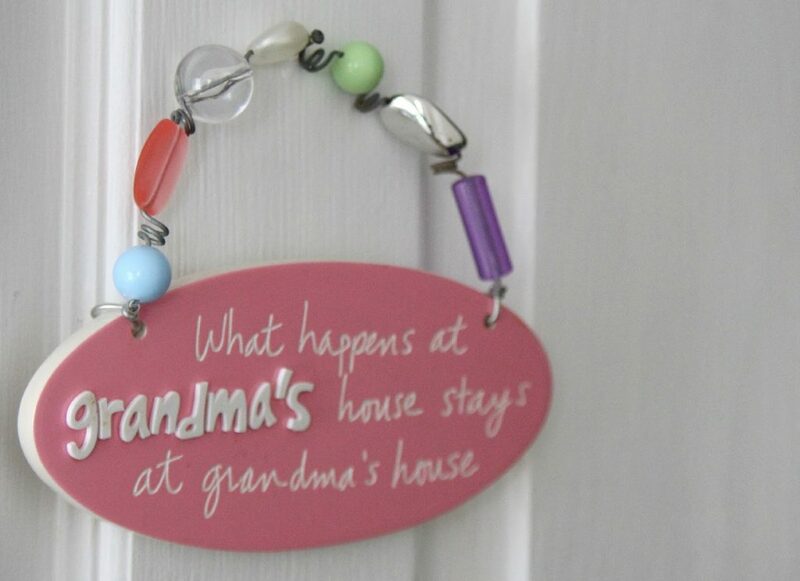 This Nonie needs idea for school vaca-I am taking the girl grans for a couple days. What a warm and inviting room for the Grans. 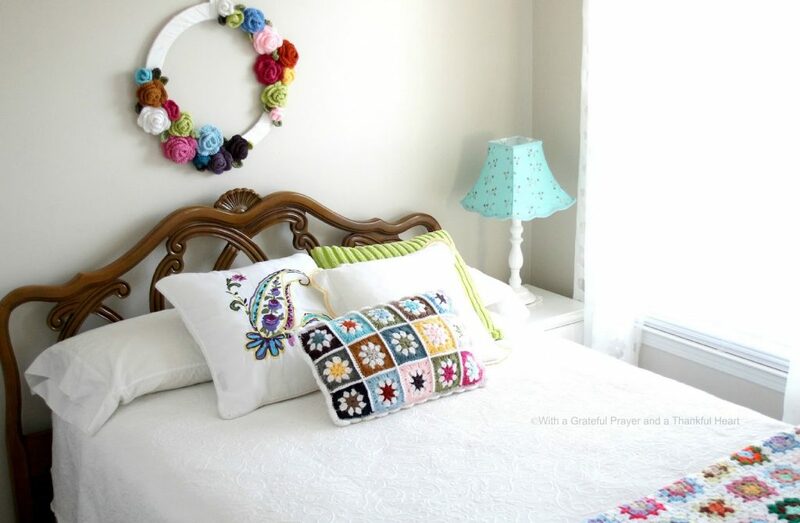 Love the throw in the bright colors. So cute! I bet sweet memories fill that room too! 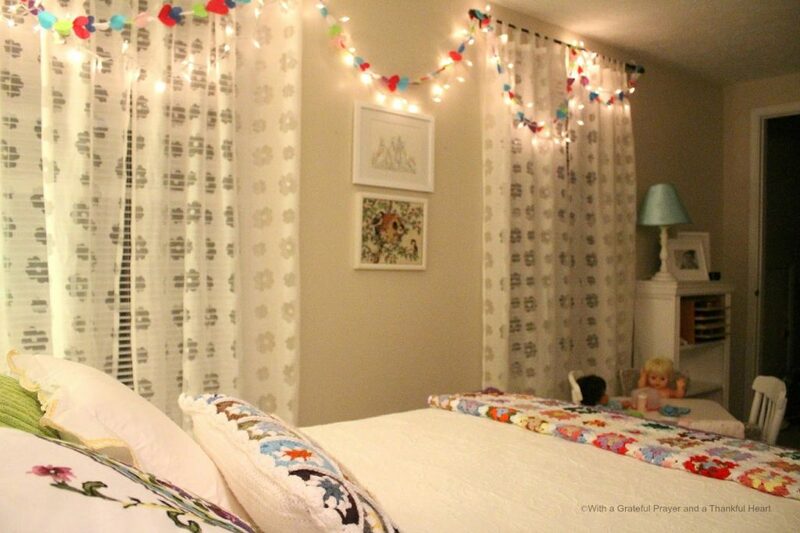 It is an absolutely darling room! No wonder your grands love to sleep (and play) there! So charming and cheerful! I love everything about this sweet, homey little room. It's perfect for the "nursery". I love that they call it that, and know that it's their own little space at grandma's. 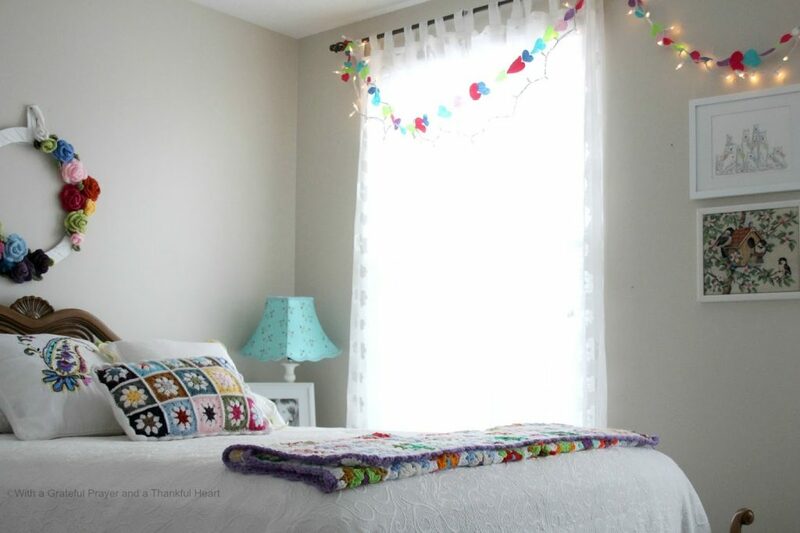 The little lights are adorable and the perfect little touch! Enjoy your week! This room is beautiful! It's so precious for little ones and so many great memories involved. Love the lights! Can you watch me for a week-I would love it at your house…LOL! Such a beautiful room! So cozy and inviting. We live with 2 of our Grands and their parents. It's so special when I get to tuck them into their beds at night. They even had a 'sleepover" in our basement living room one night. They loved it and want to do it again. So much fun being a Nana! Lorraine the room is beautiful. Any grandchild would love it. I too am keeping my grands next week for a few days, not a whole week. Fun! Oh Lorraine, I just love this! What a lovely room…I have no doubt your grands look forward with much excitement to be able to stay in this comfy and fun room. You have done a wonderful job here! Wonderful space Lorraine! I love all the memories that are part of it too. The window wall with the garland and twinkle lights is so pretty!! Enjoy your week with the little ones. Adorable! I would adore that room if I were a grand. So cute!